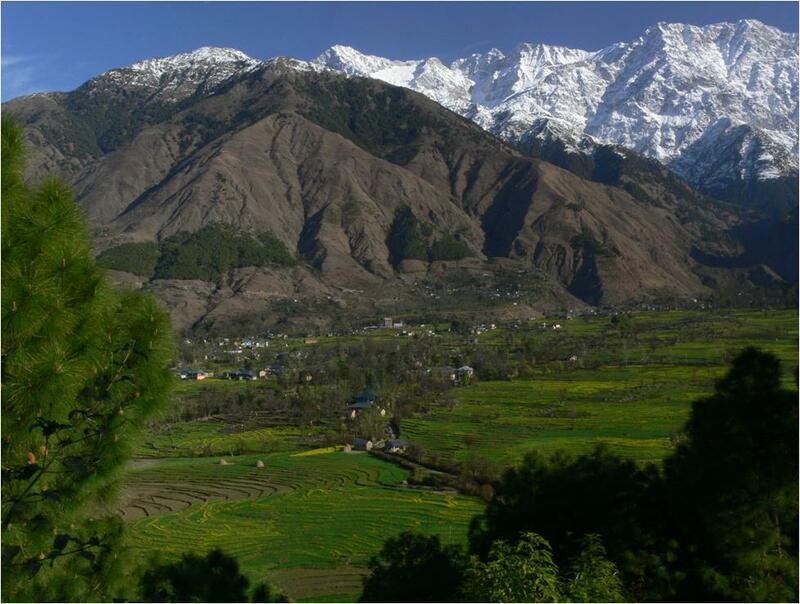 The first systematic study on Homa Organic Farming was done in the CSK Agricultural University in Palampur (photo left), Himachal Pradesh (a Northern State in India, at the edge of the Himalaya mountains). Interesting how this research project started. In 2006, Karin Heschl and Bruce Johnson, both experts on Homa Organic Farming who live in India, gave presentations at a conference on organic farming in Coimbatore, Tamil Nadu. After Karin’s presentation in which she mentioned considerable increase in the yield of mangoes in Homa Therapy atmosphere, one participant of the conference, Dr. DS Rathore, at that time Vice-Chancellor of the CSK Palampur Agricultural University, expressed his protest afterwards– saying that it is just impossible that burning cow dung and ghee and uttering some simple mantras could bring about such effects. Another senior agricultural scientist, Dr. RK Pathak, saw this and talked to Dr. Rathore – saying that it is unscientific to just claim the Homa method cannot work. A scientific approach would be to set up an experiment and show that the method does not work. Dr. Rathore agreed, so they were setting up a small Homa Organic Farm on the land of the university. In 2007, Reiner Sczypior, a Homa volunteer from Austria who then stayed in India, set up the resonance system. On that farm during several years a lot of research was conducted. Soon it became clear that the original aim – showing that Homa methods do not work – could not be achieved. On the contrary, they got many good results. They studied the effect of organic nutrients including Agnihotra Ash on crop productivity and soil health. Medicinal plants like lemongrass, wild marigold, and aloe vera were chosen. With lemongrass, there was a significant increase in the yield attributes viz plant height, number of leaves and plant spread and ultimately the yield of lemongrass increased with the addition of organics over the control. Highest biological yield (7833 kg per hectare) was obtained in the treatment with organic manure + Agnihotra Ash + sowing according to the moon calendar, while lowest yield (2833 kg per hectare) was obtained in control + not following the moon calendar. Second best treatments was that using organic manure + Agnihotra Ash, but not following the moon calendar. Also the oil content was best in treatments with Agnihotra Ash – up to seven times higher than control! "To sum up, it has been clearly demonstrated in this experiment that in lemon grass, wild marigold and aloe vera Agnihotra Ash was significantly superior to other organic treatments." The second part of their research was about soil health, a very important factor also for future production (and declining soil health is a big problem worldwide because of conventional farming). • Maximum inhibition ranged (29-42%) recorded in Agnihotra hut followed by Tryambakam hut (8-32%). • Homa ash possessed deterrent capabilities for management of these insects as compared to untreated tomato plants. • Applications of Agnihotra Ash in soil at time of transplanting & then adding Agnihotra Ash to irrigation water at regular 15 days interval was effective in management of these insects. • Bacterial counts in room where Agnihotra was performed got reduced significantly. • For comparison in one room normal fire (without the disciplines of Agnihotra) was performed. No significant changes in microbial (bacterial, fungal, and actinomycetes) counts were found! That means that for control of harmful bacteria Agnihotra performed properly is necessary – just preparing a fire does not have these effects. • In total of 70 beneficial bacterial isolates; out of these 18 isolates are bacteria which make phosphorus in soil water soluble. • 12 bacterial isolates showed Ammonia production . • These appear attractive towards development of microbial inoculants and enrichment of various organic manures. These results made it to the front page of the "Indian Express" newspaper. "Bhasma" means "Ash".